I have this really cool new dog bed in my dog jail. You see, I still have an old dog bed. Right now my old bed has a hole in it, so my person put it by the sewing machine until she gets around to fixing that hole. But Scratchy decided to take over my bed. Scratchy, can’t you see that’s a dog bed? Those are dog paw prints on that bed – not cat prints. Scratchy gets to sleep anywhere he wants. He can sleep on any of the couches and even on my person’s bed. I’m only allowed to sleep on the floor and on my dog beds. Somehow I feel like a second class citizen. I only have two dog beds to sleep on and Scratchy has all those nice, comfy places to sleep – and he decides to sleep on one of my beds. Scratchy, if you don’t hurry up and get off my bed I’m going to give you what for. I guess that did it. I scared him off that time. That’s a much better place for Scratchy. Right in front of the computer screen. Oh, wait. 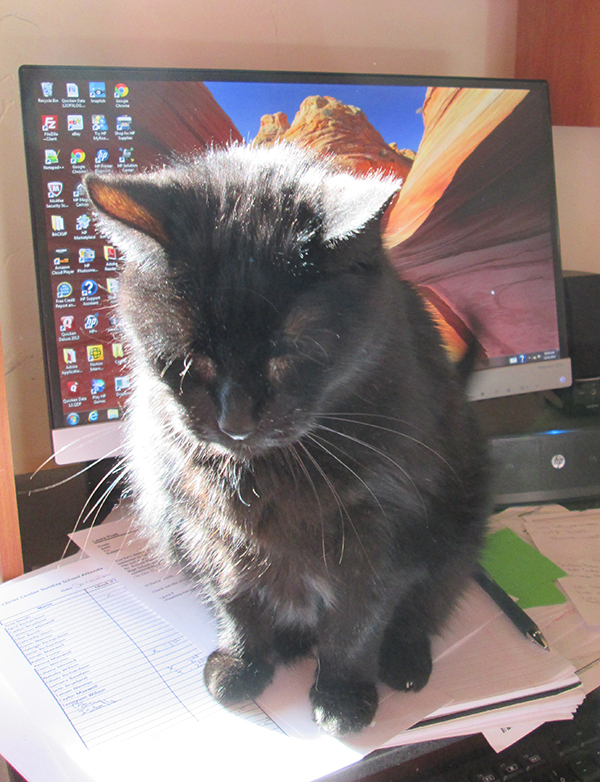 I hope my person has finished typing up my blog post. Bongo, I think all cats like to take over all beds.. I know my cats like to take over MY bed. They sure are something. Bunch of bed hogs. Jackie, I don’t know what it is with cats. I even saw a video of cats stealing dog beds and what the dogs were doing to get their beds back. It would have been funny – except there were cats in the video. Hahahaha, I think I seen that same video.. They sure do have some nerve huh. Cats are definitely a nervy bunch. Fredrieka, I guess Scratchy does stay pretty clean. He’s not allowed out of the house so he doesn’t have much chance to get dirty. Kari, I just don’t know why Scratchy has to choose my bed. Write to Way, I’m afraid my doggie bed is getting forgotten by all but Scratchy. After it gets stitched up it will need to be washed to get all that cat scent off of it. Happy New Year! Marina, I guess you’re right. Thanks for reminding me. Scratchy, you’ve got nothing on me. Now get out of my bed! But Patricia, every time I try to get on the couch I get told to get off. Now how fair is that? It’s not fair. Just be more careful and don’t get caught. What your person doesn’t know won’t hurt her…or you. Before I got stuck in my dog jail all the time I would sleep on the couch when my person wasn’t home. But sometimes I wouldn’t wake up in time and she’d catch me there. Oops. Lily, I’m going to get up there and give Scratchy what for. Then he’ll know who’s boss for sure. Thanks Little Binky. You’re a much nice cat than Scratchy. When you look at those dog prints you can think of me. Scratchy had better be careful. 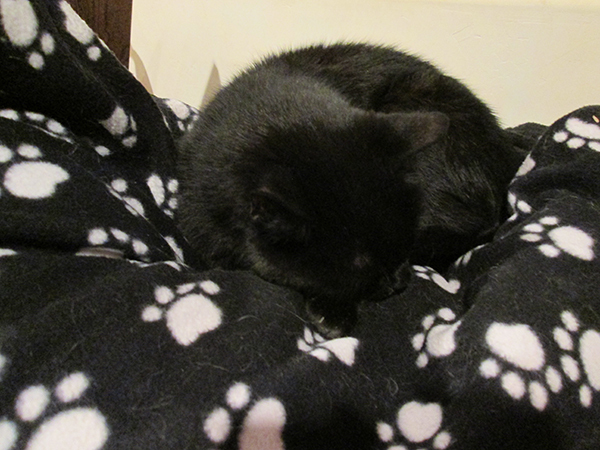 Black cat, black bed – he might get stuck inside the hole and your person will sew it up. Bye, Scratchy! Cupcake, that would be so nice. Then I could lay on my bed and smash him flat. Cooper, it seems like cats are always up to no good and hanging out where they’re not supposed to be. Bongo that is so typical of cats. Keep a paw on things there! Karen, I’ll be keeping a big paw on Scratchy for sure. Kevin, are you saying I should let Scratchy keep that bed? He’s always sleeping on it now. Sun, that’s a good idea – snuggling next to Scratchy – because he always leaves when I do that. And I would eat all his food, I used to eat it, but now my person keeps locking me in dog jail and I can’t get to it. 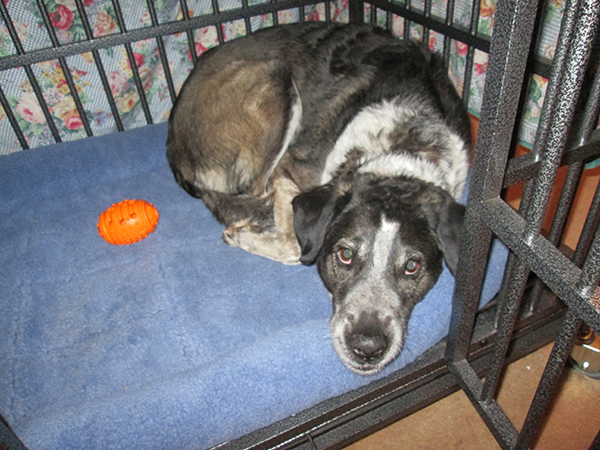 I think you should leave that old dog bed to Scratchy and receive a beautiful, super-comfy new dog bed. Or an own couch. Or an own person-bed. Or all three. And with a sign “Trespassers W”. Kolytyi, all those beds sound really great, but for some reason I get kicked of the couches and the person beds. Maybe I could get Piglet to come and chase Scratchy off of my bed. Lola, you and I are in the same boat. Those cats take over everything. Us dogs need to unite, carry picket signs, and chase the cats under the bed.